This course provides a look at how we balance personal religious idealism and family responsibilities. Along the way, we will consider topics as varied as Jewish marriage and divorce laws, Jewish burial practices, and the value of living in the Land of Israel. You will learn to suspend judgment as you take an argument to its logical extreme and examine the implications. 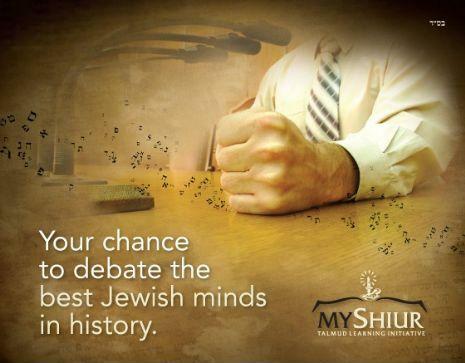 You will also learn how to trace a subject from its Biblical roots through the insightful analysis of the Talmudic sages, and you will see how the debates of the Talmud are resolved by the codifiers of Jewish law. The section of Tractate Ketuvot being examined in this ten-week course is found in folios 110b-111a. This section deals with a particular form of serious disagreement between the spouses: the refusal of one spouse to accept the choice of the other of a place of residence, in particular, if one of them wishes to reside in the land of Israel. at Chabad of Newton Centre. August 15, August 22, August 29, September 5, October 3, October 10, October 17, October 24, October 31 and November 7.